I won't be reviewing the iBGStar Glucose Meter. I was excited, like all the diabetes community, about this new meter but after reading the iBGStar™ owners manual and thinking about what is and is not worth my time, I have concluded that at this time, this new meter is not worth my attention, nor do I think yours. I received an e-mail today from US. Sanofi-Aventis announcing the availability of the iBGStar Glucose Monitoring System. The iBGStar is the first glucose meter that attaches directly to the Apple iPhone®. The meter is currently available from Walgreens, Diabetic Care Services and Apple. Prices range (without insurance) from $71.99 (Diabetic Care Services) to $99 (Apple). 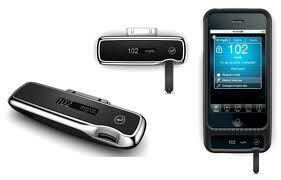 The reality is the interface appears to only save you the step of entering your glucose levels manually. The meter is a basic glucose meter and most of the cool features are from the iPhone App, which is free. The app is nice and I am reviewing that this week. (Review is done) However, It appears by looking at the picture that the meter does not fit onto the iPhone if you use a protective hard case that fully encloses the iPhone. I use an Otterbox and have no intention of removing my case just so the meter can fit. There is also the question of accessing the data port if you install the meter as displayed above. From the case in the picture above, I get the impression they intend you to leave the meter in place and charge the phone through the meter. OK, but what about plugging my phone into a docking station for music? It has been highly promoted that the iBGStar is the first glucose meter to connect directly to the iPhone. The keyword here is "Directly". Telcare has a system that connects to the iPhone over the internet. Glooko sells a solution that connects more than a half dozen meters to the iPhone from several manufactures. I am not impressed just because a device directly connects. For me, this is a step backwards in development. Why does a device receive so much fan fair when it requires me to remove my case before using? Where the hell is the wireless connectivity? When not connected to the iPhone the meter appears to be no more advanced than the cheapest meter on the market and with an operating temperature of 50°F to 104°F (10°C to 40°C), it is far more restrictive as well. The majority of the touted features are not from the iBGStar meter but the app which is just the WAVESENSE app with a new name. The app is fine (although very basic) but the "Direct" meter attachment ability only saves you from entering two to three digits. Are you kidding me? That is what the hoopla is all about, a meter that takes longer to plug into a phone and remove than me entering three digits? You can use the meter by itself, then backup the data on the phone, then you backup the phone to your desktop. Do you see where I'm going here? Even if I leave the meter connected to the iPhone, I then have to use the meters micro-USB cable to charge the iPhone. You can sync the iPhone with the iBGStar connected, using the micro-USB cable, but what about using my car charger? If you do not have a car or car charger with a USB style port, you will have to remove the meter from the iPhone. I guess if you have an invertor in the car you could plug the power adapter into that. I don't have a power inverter or USB style power plugs. You can buy cigarette plug style power adapters that have a USB power port, but I have had issues with some of those units not providing enough power to even charge my phone. AgaMatrix has a new Jazz meter coming out with Blue Tooth connectivity to their Desktop software. That's Nerdy! The Bayer Contour USB meter is a nice standalone meter and connects to any compatible pc/mac computer via built-in USB port and has up to 1 gig of available free memory. That's Nerdy! I am ashamed today as an iPhone user that I was so highly awaiting a product that would save me from pressing a couple digits. Are we so in love with our mobile devices that we would rather endure some not so minor inconveniences just so we can feel the endorphin rush from clicking a gadget directly to our precious phone? My opinion is just that, mine. Because most of what people praise about the new meter is not the meter as much as the application I wanted to provide another opinion. Below is a video from Valerie Ann. I was wondering if I could set the meal event in the BG meter alone. I work swing shift and eat my meals outside the normal time ranges. Its a pain when apps automatically select the meal based on time of day and I have to change it. You can set the Meal Schedule in the iBGSTAR app. By reading the manual it does not look like you can set any parameters during a BG reading. My guess is when you sync the meter to your iPhone, the time stamp from the meter is all the app needs to set the meal, based on you settings within the app. Does anyone know of a data/power port extension? Not a cable but a hard module that just brings the data/power port out a little. Some one made a comment that this was laaaaame. As I was approving the comment, it was deleted. Not sure what happen, but I did not want that person to think I filter opinions. They thought I was reviewing the Management Software. I will review the software and I said so in the non-review. The software is the iBGSTAR app availablee in the app store. It is almost identical to the wavesense app. The only main differencee I have seen so far is the .CVS file exported in an e-mail. The iBGSTAR file is better. It has headers and the data is easier to read.